"Villa dei Misteri" redirects here. For the Pompeiian wine, see Villa dei Misteri (wine). The Villa of the Mysteries (Italian: Villa dei Misteri) is a well-preserved suburban ancient Roman villa on the outskirts of Pompeii, southern Italy, famous for the series of exquisite frescos in one room, which are usually thought to show the initiation of a young woman into a Greco-Roman mystery cult. These are now among the best known of the relatively rare survivals of Ancient Roman painting. Like the rest of the Roman city of Pompeii, the villa was buried in the eruption of Mount Vesuvius in 79 and excavated from 1909 onwards (long after much of the main city). It is now a popular part of tourist visits to Pompeii, and forms part of the UNESCO World Heritage Site at Pompeii. Excavations in 2018 have revealed important remains of horses in a stable near the villa. Although covered with metres of ash and other volcanic material, the villa sustained only minor damage in the eruption of Vesuvius in 79 AD, and the majority of its walls, ceilings, and most particularly its frescoes survived largely undamaged. Since its excavation the roofing and other parts of the house have been maintained as necessary. The Villa is named for the paintings in one room of the residence. This space may have been a triclinium, and is decorated with very fine frescoes, believed to be painted in the early-middle 1st century. Although the actual subject of the frescoes is hotly debated, the most common interpretation of the images is scenes of the initiation of a woman into a special cult of Bacchus, a mystery cult that required specific rites and rituals to become a member. One of the defining features that help identify this as a Bacchian-related mural is the depiction of maenads, the female followers of Bacchus. These devotees are often depicted dancing with swirling drapery and were found first on Greek pottery, many of which were made before the cult spread to Italy. Of all other interpretations, the most notable is that of Paul Veyne, who believes that it depicts a young woman undergoing the rites of marriage. Though often believed to be a triclinium, the room with the frescoes could have also been a cubiculum of the matriarch, which would indicate that the matriarch was a member of the cult. The Villa had both very fine rooms for dining and entertaining and more functional spaces. A wine-press was discovered when the Villa was excavated and has been restored in its original location. It was not uncommon for the homes of the very wealthy to include areas for the production of wine, olive oil, or other agricultural products, especially since many elite Romans owned farmland or orchards in the immediate vicinity of their villas. The Villa may be easily accessed from Pompeii, lying some 400 metres northwest of the town walls, separated from it by a road with funerary monuments on either side. The Villa of the Mysteries was a suburban villa (Latin: villa suburbana) with a close relationship to the city but not of it. The ownership of the Villa is unknown, as is the case with many private homes in the city of Pompeii. However, certain artifacts give tantalizing clues. A bronze seal found in the villa names L. Istacidius Zosimus, a freedman of the powerful Istacidii family. Scholars have proposed him as the owner of the Villa or overseer of reconstruction after the earthquake of 62. The presence of a statue of Livia, wife of Augustus, has caused some historians to instead declare her to have been the owner. As in other areas of Pompeii and Herculaneum, a number of bodies were found in this villa, and plaster-of-Paris casts were made of them. There are many different interpretations of the frescoes, but they are commonly believed to depict a religious rite. Another common theory is that the frescoes depict a bride initiating into the Bacchian Mysteries in preparation for marriage. In this hypothesis, the elaborate costume worn by the main figure is believed to be wedding apparel. Based on the subject matter and order of each fresco, they are intended to be read as a single narrative. Women and satyrs are featured prominently. Because of the widely accepted theory of the mural depicting an initiation from the cult of Bacchus, some think that the room with the frescoes was used to conduct rituals and celebrations related to the god. The first mural shows a noble Roman woman (possibly the initiate's mother, who can cross no further) approaching a priestess or matron seated on a throne, by which stands a small boy reading a scroll – presumably the declaration of the initiation. On the other side of the throne the young initiate is shown in a purple robe and myrtle crown, holding a sprig of laurel and a tray of cakes. She appears to have been transformed into a serving girl, but may be bringing an offering to the god or goddess. The third mural shows a satyr playing the panpipes and a nymph suckling a goat, in an Arcadian scene. To their right, the initiate is in a panic. This is the last time we see her for a few scenes; when she appears again, she has changed. Some scholars think katabasis has occurred. n the direction to which she stares in horror, the fourth mural shows a young satyr being offered a bowl of wine by Silenus while behind him, another satyr holds up a frightening mask which the drinking satyr sees reflected in the bowl (this may parallel the mirror into which young Bacchus stares in the Orphic rites). Next to them sits a goddess, (Ariadne or Semele), with Bacchus lying across her lap. The fifth mural shows the initiate returning. She now carries a staff and wears a cap, items often presented after the successful completion of an initiation ordeal. She kneels before the priestess, and appears to be whipped by a winged female figure. Next to her is a dancing figure (a Maenad or Thyiad) and a gowned figure with a thyrsus (an initiation symbol of Bacchus) made of long stalks of wrapped fennel, with a pine cone on top. In the sixth mural her penultimate appearance we see her being prepared with new clothes, while Cupid holds up a mirror to her. After this scene, there is another image of Cupid. Finally, in the seventh Mural the initiate is shown enthroned and in an elaborate costume. This is all we know of the Roman rites of initiation. ^ "Diotima". www.stoa.org. Retrieved 2015-11-19. ^ "Villa of the Mysteries Pompeii by Raichel Le Goff". www.raichel.org. Retrieved 2015-11-19. ^ a b c "Pompeii.html". umich.edu. Retrieved 2015-11-19. ^ a b c d e f g "Dionysian Mysteries". www.hellenica.de. Retrieved 15 November 2014. ^ Linda Fierz-David, Katherine Bradway, Nor Hall, and Mary Beard and others have interpreted these murals. ^ "Dionysiac frieze, Villa of Mysteries, Pompeii". Smarthistory at Khan Academy. Retrieved February 20, 2013. Converto, Claudia. Campania, civilisation and art. Milan: Kina Italia. 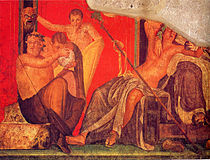 Wikimedia Commons has media related to Villa of the Mysteries (Pompeii).